It’s been seven years since the Colorado Rockies last made an appearance in the postseason, and six years since they last had a winning season. But heading into the 2017 season, there is a belief within the organization that this is the year that playoff drought comes to an end, and it starts at the top with GM Jeff Bridich, the architect of the 2017 Rockies. For the past several years, the NL West has been a two-horse race between the Los Angeles Dodgers and San Francisco Giants. Those two teams have combined for eight of the last nine division titles, with the Giants winning three World Series championships in that span. Most believe those two teams will once again compete with each other for the division crown in 2017, with the other team still having a chance to win a wild card spot. 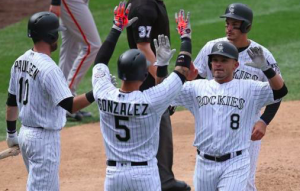 But Bridich believes the Rockies are ready to compete alongside those two heavyweights. Colorado is currently in the middle of the pack in terms of payroll, but that’s one thing that actually gives Bridich and the Rockies hope. The Kansas City Royals had the 18th highest payroll in baseball when they reached the World Series in 2014. The Cleveland Indians had the 18th highest payroll last season when they were a game away from a World Series title. The Rockies are projected to have the 18th highest payroll in baseball in 2017. But that little coincidence is not what has Bridich believing the Rockies are destined to reach the postseason this year. Part of what has the Rockies poised to make some noise is a pair of calculated risks on the part of Bridich. First, he dished out a long-term contract to Ian Desmond with the intention of making him the team’s first baseman. He then took a chance on Holland to potentially be the team’s closer after spending last year recovering from Tommy John surgery. With Desmond, the Rockies add an impact offensive player who helps to make an already potent lineup that much more dangerous. However, the risk is that Desmond, despite being a great athlete, has never played first base. If Desmond is unable to handle the position or proves to be a liability defensively, the Rockies have no obvious replacement and no other place to put Desmond without displacing another key player, meaning there could be big problems if the move doesn’t work out as planned. Holland, meanwhile, has the potential to be one of the top closers in baseball. Of course, there’s no guarantee he’ll be the same pitcher he was before surgery. If Holland returns to form, he has a chance to lead a rock solid Colorado bullpen. However, if Holland suffers a setback or struggles in his return from injury, the Rockies could have difficulty solidifying their bullpen. The signings of Desmond and Holland are obviously high risk-high reward moves, but Bridich believes if they work out, the rest of Colorado’s roster is ready to take that next step. So while most still believe the NL West will be a two-horse race, the Rockies believe they’re ready to throw their hat into the ring and make some noise in 2017.